PVCu Sliding Patio Doors – In-line or tilt & turn? PVCu sliding patio doors can be specified as either in-line sliders or as tilt and slide doors. In-line sliding patio doors are generally made up of one fixed glazed panel and one which slides across it to form the opening. Early patio doors, especially in aluminium frames, had the sliding section on the outside of the fixed panel and posed a security risk. The sliding section could often be easily lifted out completely to gain access from outside. Modern PVCu sliding patio doors have the sliding section on the inside of the fixed panel – this not only reduces the security risk but also means that the sliding track is better protected against inclement weather. 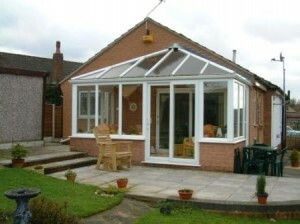 For wide brick apertures, PVCu sliding patio doors may have to be split into more than two sections. Three part PVCu sliding patio doors would generally have the centre pane sliding across one or both of the adjoining fixed panels. Four part PVCu sliding patio doors would normally have the centre two sections sliding, one to cover the left fixed panel and one to cover the right fixed panel. Tilt and slide patio doors offer an additional function to in-line sliders as the sliding door can also tilt inwards into the room. This two way opening facility increases both the complexity of the opening mechanism and also the price. The major benefit of tilt and slide patio doors over in-line sliding patio doors is the ability to provide ventilation without the door being open for access. 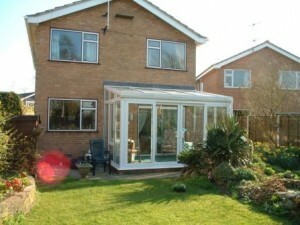 PVCu sliding patio doors or double doors? When deciding whether to have sliding patio doors or double hinged doors in your home, you should always consider the overall width of the brick to brick aperture. Below about 1,500 mm wide may not be suitable for a patio door as (when allowing for the width of the fixed frame and the outer frame of the slider) the ‘walk-through’ dimension would be impractically narrow. Double doors or French doors would be more appropriate. Additionally, for an aperture below about 1,200 mm wide, double doors may not necessarily be appropriate either because to form a practical walk-through width would require that both doors are opened at the same time. In this case perhaps a single door of 900 mm wide and fixed side panel taking up the balance would be more practical. Equally, when installing double doors in an aperture wider than 2,000 mm could mean that the hinged doors become an obstruction, and fixed side panels should be considered. The wider the brick to brick dimension however, the larger the number of design combinations there are available. Ultimately, regardless of the practicality offered by the size of the brick to brick opening, it is often personal choice as to whether French doors or patio doors are chosen.